Jensen Beach, Fla., August 17, 2017 – STS Aviation Group is a global company that specializes in support services for the aviation industry. What started as a family-owned-and-operated business back in 1986 has quickly grown into one of the largest, most successful aerospace service providers in the country… and beyond. This fact is backed by STS’ continued inclusion on the elusive Inc. 5000 list. 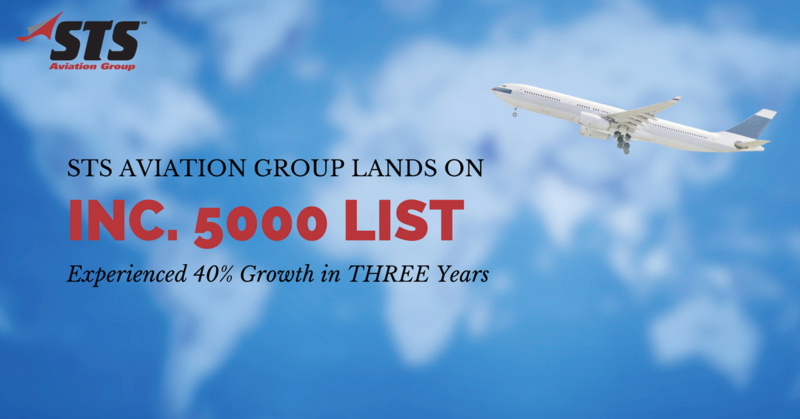 The 2017 Inc. 5000 list shows that, in the past three years, STS Aviation Group experienced 40% growth. In 2016, the company reported $232.1M in annual revenue while proudly employing more than 1,700 people around the world. When closely examining this year’s Inc. 5000 list, 97.5% of the companies included reported less revenue in 2016 than STS Aviation Group. In addition, 85.5% of companies reported revenue less than $50M. These facts help shed light on how monumental this achievement is for STS; an achievement that far surpasses the Inc. 5000 ranking system. To learn more about STS Aviation Group and the aerospace industry solutions it provides, please visit www.stsaviationgroup.com. STS Aviation Group is a diversified company that specializes in support services for the aerospace industry through its nine divisions, STS AeroStaff Services, STS Engineering Solutions, STS Line Maintenance, STS Component Solutions, STS Air-Pro, STS Repair and Modification, STS Mod Center, STS AeroMod and STS NDT Services. From staffing your team so it can get the project done right and at an affordable price, to providing certified aircraft and engine components so you can get off the ground and back in the sky, STS continues to be a one-stop servicing center for all of your company’s aviation staffing, aircraft engineering, line maintenance, component sale / distribution, hose manufacturing, aircraft repair, and aircraft modification requirements. To learn more about what makes STS the company with “Solutions to Keep You Flying,” please visitwww.stsaviationgroup.com or call at 1-800-800-2400.